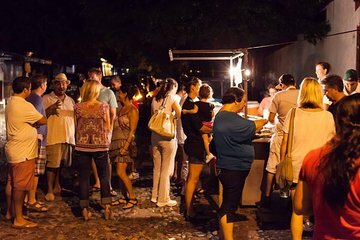 Mangia la tua strada attraverso una porzione di Puerto Vallarta in questo tour di mangiare e camminare decadente. Passeggia per le strade di Emiliano Zapata e dei quartieri di 5 de Deciembre fermandoti per assaggiare le delizie locali. Mangia campioni di tacos, quesadillas, churros, sopes, pozole e molto altro ancora. Fermati in 4 diversi stand di tacos e carri per mangiare deliziosi al pastor, pesce fresco e altre varietà. Per tutto il tempo, scopri la storia dei quartieri dalla tua fedele guida locale. My friend and I enjoyed this tour tremendously. The tacos were all tasty. Our guide was both funny and informative. The tour size was just right. And there was just enough walking time between tacos, that we didn't feel stuffed by the end. My highlight was the last stop for a churro for dessert! Bernardo was our guide for the evening taco tour. We went to 8 different stands, we learned some of the history behind each stand, and we got to see where locals eat. We learned about the culture of Puerto Vallarta and saw some amazing sights like the Cathedral. After the taco tour we ended up going back to a few of the stands during our visit because their food was amazing. This was an excellent food tour with a good guide. I believe her name was Andrea. Sorry - I am doing this review several months later and I can't totally recall her name. We visited several taco stands in the Romantic Zone and Old Town and also travelled by local bus to a different neighbourhood in order eat delicious Churros which we were able to watch being made and cooked. We would highly recommend this tour especially if you are a new visitor to Puerto Vallarta and not sure about street food. The tour convinced us that taco stands provide an economical and safe alternative to restaurants. This tour is a must for anyone wanting to experience off the beaten path taco eateries and stands. The food was delicious and truly a fabulous evening. Our guide for the evening ensured each person in our group was attended to and paced the walking part of the tour so everyone could keep up with the group. The definite highlight of the evening was the Churro stand and the end of the tour. Our group of 6 had a fabulous time on the taco adventure. Our leader Juri was extremely knowledgeable and delightful to be with throughout the evening. We enjoyed each restaurant and taco stand we visited and loved the walk through different neighborhoods. We appreciated that the tour accommodated 1 of us with a gluten allergy and another who is a vegetarian while the rest of us were able to have the varied meats, fish and sauces that were particular to the locale. Our bellies were happily full after 7 stops, plus a very cool stop at a lounge and finishing the night with deliciously sweet Churros. We will recommend this tour to others. Great time best excursion of our trip. Guide was a great guy and very knowledgeable! Highly recommend but do not eat before you go! Shawn was awesome knew the town and knew the taco stands and the history behind them! There was not a bad taco in the bunch and the churros where amazing !! Fun night walking all over the city!!! Would totally recommend this tour and would go on one of your first nights so you will know where to go back to!!! Great fun! This was a really cool tour and I highly recommend this for anyone who wants to see more authentic parts of the city and enjoy a diverse set of tacos. It was just the four of us so we had a private tour. Our guide Miguel was great and very knowledgeable and took us to different taco stands in the area and knew the history of the owners and the types of food. It was also nice to walk around between stops. This included a short bus ride in between which was also a welcomed opportunity to ride a city bus in downtown. A great way to spend an evening. Make sure you come to this tour hungry, because there is a lot of eating it is a full dinner by the time you are done sampling all the tacos. This tour was an excellent start to our trip! Our guide Manuel was very friendly and accommodating. He took great care of us at each of the 8 stops we made. We LOVED the tacos al pastor and fresh churros. At the end of the tour, we were stuffed and went back to our condo very satisfied.